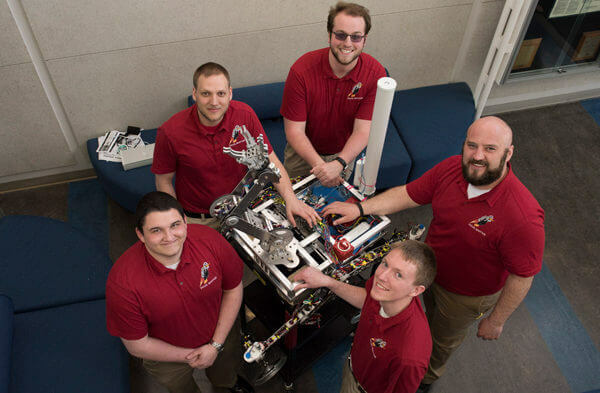 The NIU Mars Rover team, Picus Martius, won first place in the mechanical engineering division and best overall in the NIU College of Engineering and Engineering Technology’s Spring 2017 Senior Design Day. Each year, seniors in the college form teams to work on a project that demonstrates what they have learned. This semester, 158 students presented 45 projects to judges representing faculty, industry partners and alumni. Students on the winning teams in each division received cash prizes; more importantly, the completed projects demonstrate to future employers that NIU graduates master not only theoretical concepts but have the skills to apply their knowledge. All seven projects in the industrial and systems engineering category were sponsored by corporate partners who asked the student teams to present solutions to current business challenges. The winning team redesigned the workflow of a pump assembly line at manufacturer SPX Flow’s Rockford facility. The new layout takes up less warehouse space and will eliminate the need for overtime on the line, saving the company more than $18,000 a year. The Picus Martius project was the brainchild of team member Dan Petschow, inspired by the University Rover Challenge, an annual college-level Mars rover competition hosted by the Mars Society. The team had less than nine months to develop their rover and pit it against far more experienced teams that have been refining their rovers for years. The other teams in the competition also average 30 to 40 members to Picus Martius’ five, the NIU students said. Nonetheless, the team made it to the third round before being eliminated. The members have passed the torch to a new group of students who intend to continue refining the rover to compete again. The winning team in the electrical engineering division will also continue to refine its product, members said. The A.D.A.P.T. is a lightweight prosthetic hand that provides a wearer with the ability to grasp. The team estimated their prototype is one-third the weight and can be marketed for one-twentieth the cost of prosthetics currently on the market using similar technology. Though all three team members are graduating, they described the project as a labor of love and said they will continue to work together to perfect it. In the technology division, there was a tie for first place between the team that created the EZ-Lift, a mobile cart industrial and warehouse employees could use to move loads up to 400 pounds and lift them to varying heights, and the team that created the Human Centric Building Control System, an automated system that monitors and adjusts light, temperature and humidity in a room in an energy-efficient manner. Projects tackled a range of topics, including energy, fitness, the environment and industrial challenges. See the program with the full list of projects at go.niu.edu/senior-design.